Written by a spiritual giant of the nineteenth century church, the book contains much-needed advice and clear guidance. Bonar gathers together a great number of Bible verses that will prove eminently suitable for a wide range of individual cases. 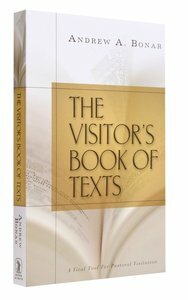 These selected scriptures are interspersed with the author's own brief, spiritual, and helpful comments. Here then is a book that should be in the hands of every Christian visitor. It ought to be consulted prayerfully before embarking with God's Word to the sick and sorrowful. About "The Visitor's Book of Texts"
Andrew Alexander Bonar, was a minister of the Free Church of Scotland--Collace, Perthshire, 1838-1856 ; Finnieston Free Church, Glasgow, 1856-1892. He was identified with evangelical and revival movements and adhered to the doctrine of premillennialism. With Robert Murray McCheyne he visited Palestine in 1839 to inquire into the condition of the Jews there. During the visit of Dwight L. Moody to Britain in 1874 and 1875, Moody was warmly welcomed by Bonar, despite the latter receiving considerable criticism from other Calvinist ministers in the Free Church. Selected published writings of Bonar include A Narrative of a Mission of Inquiry to the Jews from the Church of Scotland in 1839, Memoir and Remains of Robert Murray McCheyne, Commentary on Leviticus, Christ and his Church in the Book of Psalms and Redemption Drawing Nigh, a defence of the premillennial advent. Bonar also edited Samuel Rutherford's Letters (1863); and wrote many tracts, pamphlets, and minor biographies.